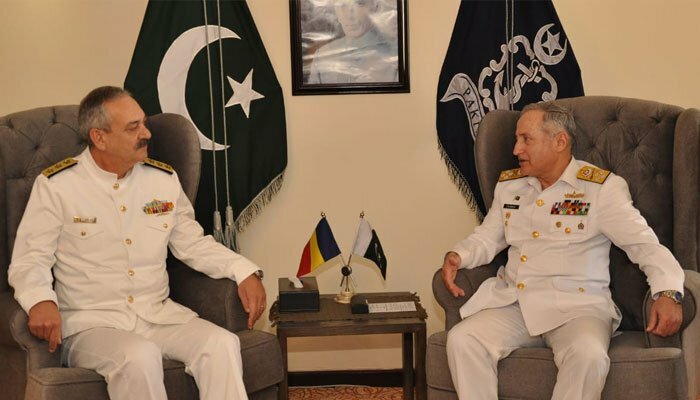 Chief of the Naval Staff Admiral Zafar Mahmood Abbasi met various foreign military delegates on the second day of multinational maritime exercise ‘AMAN 2019’ in Karachi on Saturday, the Pakistan Navy said in a statement. The military delegates who held separate meetings with the naval chief included Commander Zimbabwe National Army Lt General Edzai Absalom Tafadzwa Chanyuka Chimonyo, Chief of Romanian Naval Forces Vice Admiral Alexandru Mirsu Ph.D., Chief of Coast Guard State Border Service Azerbaijan Lt General Afgan Taghiyev Veli and Admiral (retd) William A. Owens of USA. During the meetings, matters of mutual interest including defence-related collaborations and maritime security dynamics were discussed. The naval chief also thanked the dignitaries for participation in ‘AMAN 2019’ to enhance the collaborative efforts for peace and security. He highlighted Pakistan Navy’s efforts for ensuring maritime security and peace in the region through Regional Maritime Security Patrol and regular bilateral or multilateral engagements with other countries. The dignitaries highly appreciated and acknowledged Pakistan Navy’s efforts and focused commitments in support of collaborative maritime security in the region and conduct of AMAN exercise. Military dignitaries from Royal Saudi Naval Forces and Turkish Navy called on Vice Chief of Naval Staff, Vice Admiral Kaleem Shaukat. Representatives of all foreign participants of AMAN 2019 laid floral wreaths at Shuhada Monument at PN Dockyard to pay homage to the martyrs.